When I walk in Finca Cantaros, our nature reserve in the mid-elevation highlands of southwestern Costa Rica, this question comes frequently to mind. Perhaps it should be a verbal talisman or mantra for anyone who recognizes that human beings are easily distracted—that we can use only a fraction of our brain power at any given moment—and, likewise, that our vision of what’s around us is pitifully limited. Tropical forests are especially complex, and focus on one area of vegetation means necessarily neglecting others. But I want to see everything. I coach myself, camera in hand, to spiral my concentration outward as I observe the scene before me. The joys of discovery are intense: whether investigating a minor movement in the foliage from afar and identifying a bird in the canopy, or spying a beetle mining bark up close. When I’m fully attuned, the witnessing seems miraculous. I’ve been a naturalist since I could walk. As a small child in New England, U.S.A., I waded in brooks and learned how to catch frogs and salamanders and feel their hearts beating against my hand. It wasn’t until after age 40 that I realized how important the natural world was to me and left the legal/business world for a life surrounded by tropical nature. I worked eleven years with the Organization for Tropical Studies (OTS) at its Las Cruces Biological Station in Costa Rica. It was particularly inspiring to work with botanists and ecologists. With their help I learned to interpret and share with visitors information about the natural history of native plants and their relationships with pollinators, seed dispersers and herbivores. In 1994, while working at Las Cruces, I purchased 17 acres of cow pasture with a wetland pond and set about, with help from Tico (Costa Rican) professionals, reforesting and restoring the land now called Finca Cántaros. In addition, I designed gardens not only for personal enjoyment, but for our neighbors, national and international visitors, so they could bird and picnic in a quiet refuge only minutes from town. Those who visited multiple times could witness over the years the growth of over 5000 trees of about one hundred different species and the return of greater biodiversity. I planted then–and plant now–with birds, butterflies, and small mammals in mind. What do they need? These many years later, the forest and understory plants are dense secondary growth and provide cover and food for myriad creatures. The pond and marsh are likewise diverse biomes. Gail Hewson Hull. Foto Diarist. In 1999, I left Costa Rica temporarily and enjoyed an exciting seven-years working with biologists at the California Academy of Sciences (CAS). Both of these work experiences enriched my life beyond measure. 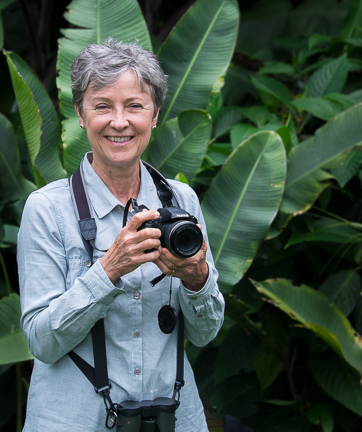 Association with scientific researchers and their joy of sharing knowledge gave me the bug: to follow my curiosity and dedication to tropical diversity wherever it leads. During the last decade, I have taken time to record my interests photographically wherever I go. Now in my late 60s, I would like to share some of these photos and the stories behind them. With this blog, I hope to select from and make sense of my personal vision. May you, fellow quester, find something of interest among my pictures—and stories—of people, places, flora and fauna. Ai Weiwei, the consummate Chinese artist, writer and dissident said, “Creativity is part of human nature. It can only be untaught.” I believe the same can be said of scientific curiosity. May these writings and photos come to you as occasional letters from a friend exploring our magical world. Equipment note. My current versatile and lightweight camera is a Fujifilm S1 Finepix, 50X Zoom. Tech note. Without my husband Harry’s tech support, this blog would never have seen the light of day. The Foto Diarist logo, above, is copyrighted by Gail Hewson Hull 2015.